Cleaning windows is a tough job with many factors affecting the end results. Here, Irina Kem, senior director of marketing at Swish Maintenance Limited, points out critical elements that facility maintenance crews must address this spring in order to achieve streak-free sparkling windows. What challenges come with cleaning windows? There are many challenges that must be considered and addressed to achieve sparkling, streak-free windows. Glass surfaces are often high and difficult to access. There are different types of glass with different cleaning behaviours; some coatings are extremely hard to clean. Window frames and construction materials sometimes peel and soil windows with traces of lime, making them even harder to clean. Water hardness can play a negative role, as well as direct sunlight, which dries windows quickly and makes them more susceptible to streaking or gusty winds that increase safety concerns. How can one get desired results? Products, tools and processes are three major factors affecting the quality of window cleaning, but they’re also easy to control. While cleaning with water may be sufficient in some cases, most windows and glass surfaces require the use of a window cleaning solution to break the bond between the surface and the soil. Some multi-purpose cleaners claim to be streak-free, but fail to deliver. Select a professional-grade, fast-drying glass cleaning solution that is formulated specifically for streak-free windows and glass cleaning. Select professional-grade tools for the job from a trusted supplier. These tools are much more durable and help increase cleaning efficiency and reduce fatigue. Depending on the application, a traditional squeegee may work just as fine. 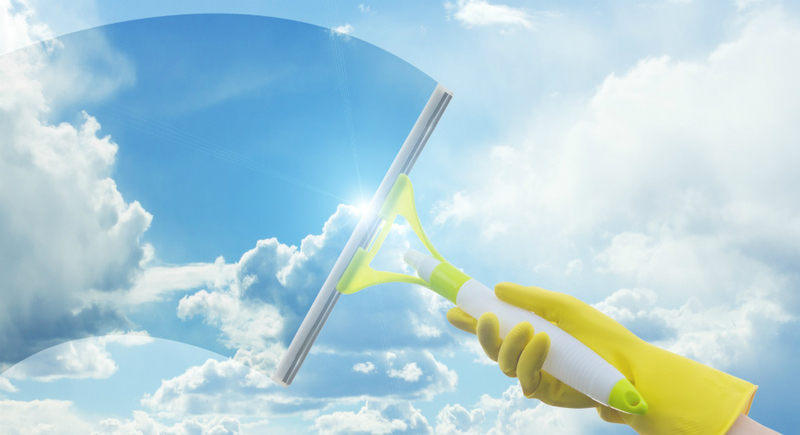 For higher productivity though, you may want to consider a window vacuum to speed up the drying stage or an integrated indoor glass cleaning system that combines microfibre technology with a pivoting, triangular, solution-fed head on a telescopic pole. Prepare: having the proper tools, including personal protective equipment, at your fingertips helps save time and labour. Be sure to avoid very hot days. Pre-Clean: check the glass or window surface for any aged deposits like adhesives or leaves, and remove them using a safety scraper or scrub sponge. Clean: when cleaning large glass surfaces, use a rectangular bucket. Use a scrub sleeve to apply the cleaner. Using the squeegee, start at the bottom and pull upward, framing the window. Wipe your squeegee dry after each pass to prevent streaking. Gain productivity: use a window vacuum to cut the drying time and an integrated window cleaning system to clean hard-to-reach areas easier and safer, while using less cleaning solution. Determine the process that works best for your facility, windows and staff and ensure it is being adhered to. Following the proper procedures with quality products will deliver exceptional end results. What are some incorrect cleaning methods? From having limited supplies and ignoring hot weather conditions to not removing deposits before cleaning windows, little misses add up. While not everything can be foreseen, the more prepared you are, the better and faster the results. Cleaning windows requires time and an unexpected amount of energy. Start small and do it right the first time. Start and finish one window or one set of windows; it will be easier to continue. Depending on the number of windows you have to clean, consider a professional window cleaning service to help get the job done faster and safer. Using more cleaning solution will not be helpful; you’ll end up with extra work, removing excess liquid. Cleaning solutions that are specially formulated for window and glass cleaning do the job with only a little amount, saving you time and money. Always follow the directions on the window cleaner label. When using a spray bottle, spray a small amount onto a microfibre cloth, wipe the window or glass surface that needs cleaning and use a dry cloth to wipe away excess liquid. Integrated high-reach window cleaning systems accomplish this task with the solution applied to the microfibre pad that cleans the window. The safety of your workers, as well as the public, must be a priority when cleaning windows. Errors and faulty equipment may lead to injuries and even deaths. From personal protective equipment and safely securing the ladders to using special high-reach window cleaning tools that enable you to clean from the ground, these are some of the steps you can take to reduce the risk of injuries and increase safety for all involved. How can you eliminate the risk of injuries? More than 40,000 workers get injured annually due to fall accidents, according to the Canadian Centre for Occupational Health and Safety (CCOHS). A ladder is the most commonly used tool when washing windows, making it a high-risk job. Much can be done to reduce the risk of falls and injuries by adhering to ladder safety rules. CCOHS offers an online course on ladder safety that can get you and your employees up to date on best practices. Research other options. You can reduce the risk of falls with newer indoor battery-powered window-cleaning systems. They are ergonomically built and can reach up to 13 feet using multiple lightweight extending poles. For outdoor window cleaning, consider high-reach systems with water-fed poles. These light-weight, yet rigid poles, help safely clean upper-storey windows from the ground level. The extension poles can attach easily to reach heights from 10 to 65 inches. With inexpensive operating costs and ergonomic design, both indoor and outdoor high-reach window cleaning systems help increase productivity and safety, while reducing fatigue. Irina Kem is the senior director of marketing at Swish, a leading distributor of professional cleaning products, solutions and equipment throughout Canada. Her marketing career in sanitation, distribution and manufacturing spans more than 15 years. She is passionate about promoting safe and effective cleaning solutions and the key role of the sanitation industry in creating cleaner, safer and healthier working and living environments.